I love banana bread. For the past few years, my go-to recipe has been this one from Simply Recipes. I like it because it’s simple and incredibly flexible–I long ago replaced the all-purpose flour with variations of whole wheat, varied the number of bananas, added everything from chopped candied ginger to chocolate chips, and ended up with a tasty loaf every time. A few months ago, Jesse Miller, the editor at Jen Reviews, emailed me. Jen Reviews is a food/fitness/lifestyle site that among many other things posts recipes. Jesse noted my past post, and asked if I would consider trying one of their recent recipes for a Fruit and Nut Banana Loaf and, if I liked it, posting the results. I said ‘Sure!” because hey, banana bread, and also because I thought it was cool to be asked to try a new recipe. The first issue I encountered was the fact that the recipe called for ingredients to be weighed. I had heard for years that weighing flour in particular resulted in more accurate measurement and a better outcome, but I had never bothered because dry ingredient measurements for the recipes I had used in the past were also given in cups and that’s what I was used to. This recipe, however, listed either grams or ounces. My old kitchen scale was an inexact analog model that I didn’t trust as it would be too easy to be off an ounce or more in either direction. So I headed off the a local big box and hunted through the kitchen wares until I found a nice-looking digital scale. I picked this one because it could measure ounces, grams, or kilograms. 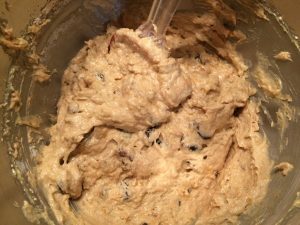 The second stumbling point arose when I read the recipe and found that it called for either raisins or glace cherries. I had raisins, but I’ve used them in banana bread before, and wanted to try something different. I had maraschino cherries, which are one step removed from glace cherries, the latter being maraschino cherries that have been further cooked in sugared syrup. But, I’m not a fan of maraschino cherries as I feel they lack in flavor. I did, however, also have Luxardo cherries, which are Maraschino cherries packed in Marasca cherry syrup. 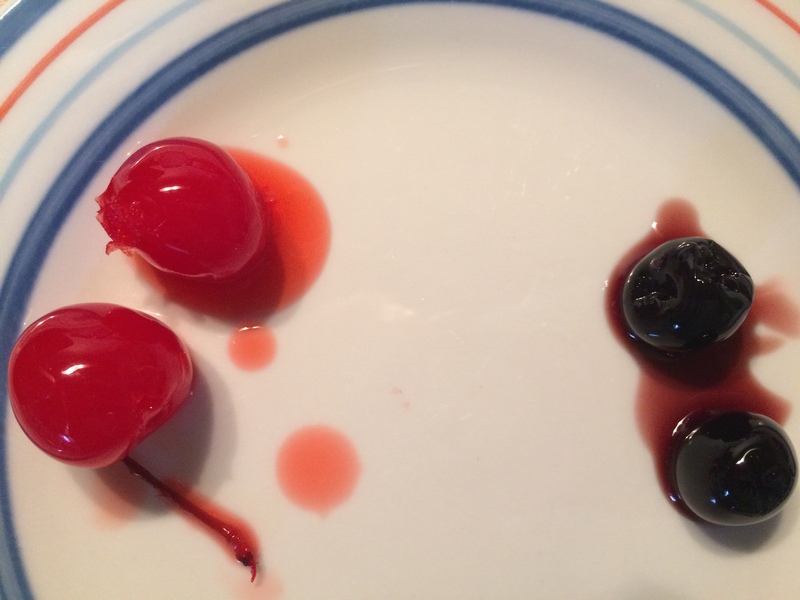 As you can see below, they are much darker than regular Maraschino cherries, and also much tastier (the syrup also makes a great dessert topping). So, I sliced up the requisite 3 ounces and set them aside. I also learned about caster sugar, which is sugar somewhere between regular granulated sugar and confectioners sugar in size. It’s common in the UK, but hard to find in the US–I had looked for it in a couple of grocery stores and came up empty. I decided to go with the unrefined cane sugar that I usually use when baking, and hoped that it wouldn’t adversely affect the final product. In addition to needing to weigh ingredients, I encountered some other minor speed bumps. I didn’t have self-rising flour, which is all-purpose flour that already contains baking powder and salt. I have substituted whole wheat pastry or white whole wheat flours for white all-purpose for years, and have always added the other dry ingredients separately. So I weighed my Bob’s Red Mill Whole Wheat Pastry Flour, added the appropriate amounts of salt and baking powder to bump it up to self-rising, then added the rest of the dry ingredients, along with a teaspoon of cinnamon. I then creamed the butter and sugar until fluffy with my electric stand mixer (a Kitchen Aide Artisan), added the eggs, vanilla, and bananas, then folded in the dry blend and milk by hand as directed. Finally, I folded in the fruit and nuts. The resulting batter is pictured above, a dense but moist mixture that I usually get when making quick breads. 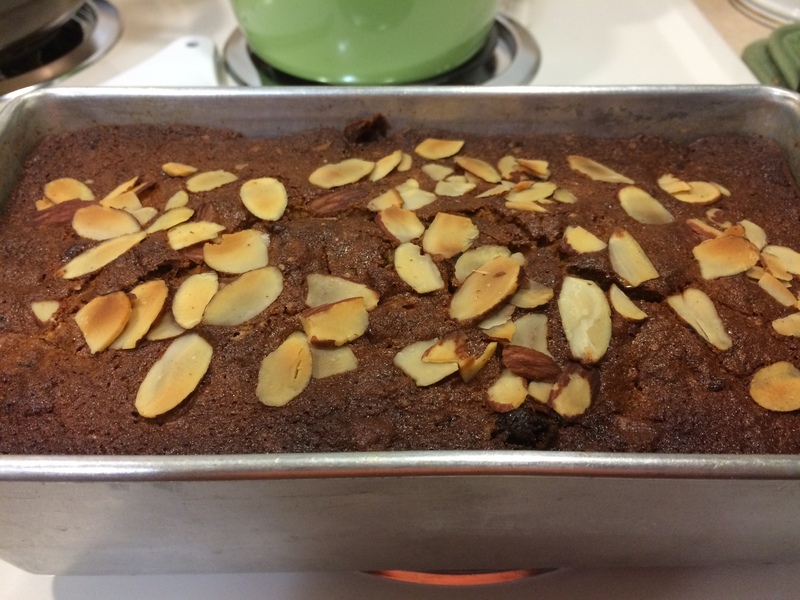 I piled the batter into the loaf pan, topped it with sliced almonds, and put it into the oven. Baking times are usually longer in my oven, so I added an extra 10 minutes for an hour total, checked for doneness with toothpicks, and wound up leaving it in for a few minutes more. I’m overly cautious when it comes to determining whether something is done or not, and actually prefer baked goods on the well-browned side. I am therefore prone to leaving cakes and cookies in the oven a little too long. That said, my loaf didn’t develop the nice cracked top that the Jen Reviews loaf did, but that was likely due to the differences in flour and sugar and general handling. I enjoyed this bread. I didn’t pick up much in the way of banana flavor, but that may have been because the bananas I used weren’t as ripe as they should’ve been. 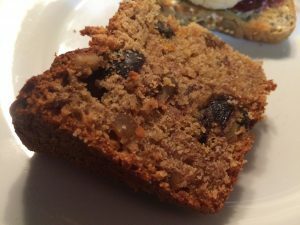 The orange and cherry flavors did come through, though–I shared the loaf with friends, and they agreed that the bread tasted more like a fruitcake than a classic banana bread. That said, we all really liked it. The crumb proved dense but light, if that makes sense. Maybe ‘soft’ is a better word than ‘light.’ I understand that by changing ingredients as I did, I didn’t really make the recipe as shown and may not have provided a fair evaluation. But I almost always alter recipes even when they’re new to me, and I consider it a sign of a cook-friendly recipe if it can tolerate some flexibility and still yield a good result. I enjoyed this variation on the banana bread theme, and would definitely make it again. Now that the weather is getting colder here in northern Illinois, a little holiday fruity-nutty goodness is a welcome thing. 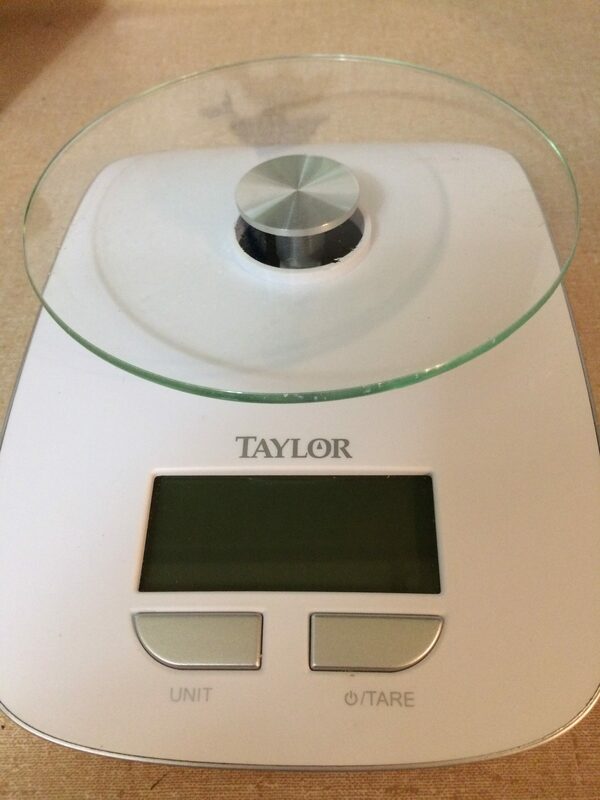 As a side effect, I am also using my digital scale almost every day, both to weigh cooking/baking ingredients and recommended serving sizes. Boy, is that an education.